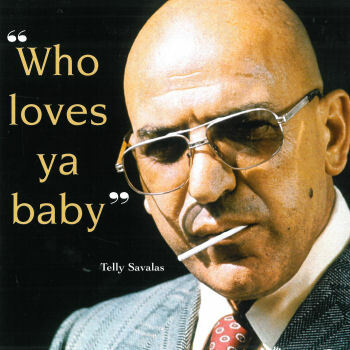 Some of you, whether you like to admit it or not, may remember the original Kojak TV series, which ran from 1973 to 1978, featuring a bald New York detective played by a lollipop sucking Telly Savalas who repeatedly used the catchphrase, “Who loves ya baby” The expression “Who loves ya baby” was used to affirm that something good had been done or will be done for the person to whom you are speaking. I never thought that a simple catchphrase like that could have a profound impact on the outcome of an election – until now. Conventional wisdom, which may not have been so wise after all, posited that the overriding issue in this election was the economy. In retrospect that may not have been totally true. In addition to the economy, which was the most publicized issue de rigueur, the concerns of the voters also consisted of matters relating to: women, Hispanics, Blacks, Jews, Gays, and seniors. For women it was birth control and abortion, for Hispanics it was amnesty, for gays it was marriage, and for seniors it was Medicare, and for Blacks and Jews it was how they have always voted in recent memory. Nevertheless misconceptions about voter demographics and how they vote abound. For example, some claim that Jews vote based on concerns over Israel and Blacks vote based on skin color. Neither one is true. In fact only 10% of Jews polled said that they considered Israel important in determining their vote and Blacks have voted for Democrats at an 85% to 90% clip before Obama was a candidate. Clouding part of the reason why there was such a lopsided number of Electoral College votes favoring Obama over Romney may be due to the fact that voters, who embraced a diversity of unrelated agendas, coalesced into a unified voting bloc. The reason that occurred may be because the parochial concerns of each voting bloc shared a common thread, a thread which tied disparate interest groups into a Gordian Knot that the GOP could not untie. The question is what was that common thread that caused the GOP’s presidential campaign to unravel so hopelessly? Some attribute it to the differences in the candidates’ speeches, style, demeanor, and debate performances. Of course there was also hurricane Sandy which flooded the news media and perhaps helped turn the tide of the election. But I think there was something else going on, something much more fundamental, even more significant than political platforms. It has to do with perceptions not programs, feelings and not facts. Over the years our government has incrementally grown in size and scope. Consequently more people regularly depend on government services now than in the past. Their dependency on government assistance is based on financial need in some cases and in others the pursuit of social justice. Today those mired beneath the poverty level fortunately have many supporting programs available to them. And for those seeking social justice there is the weight of law to protect them. The poor and disadvantaged are the beneficiaries of a benevolent government, although an imperfect one, which maintains assistance, entitlement, and emergency relief funds, as well as, a variety of social welfare programs. Those programs were implemented by duly elected representatives of our compassionate country whose citizenry is comprised of empathetic people who genuinely, “feel your pain”. The Republicans tried to convince the voters that their party cares for what is good for America. The Democrats tried to convince the voters that their party cares for what is good for them.